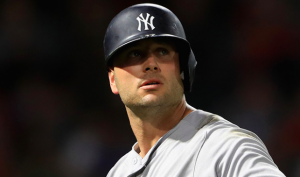 Veteran slugger Matt Holliday is back in the big leagues. He’s also back in the place where his career began. The Colorado Rockies called up Holliday on Thursday, putting him in the lineup during the team’s win over the Padres. The Rockies are hopeful that Holliday can make a difference down the stretch, as they find themselves in a tight race for both the NL West title and the two wild-card spots. The Rockies quietly signed Holliday to a minor-league contract last month. He remained unsigned in the spring after spending last season with the Yankees. Looking for another bat with power, the Rockies took a chance on Holliday to see if he had anything left in the tank. Holliday, of course, spent the first five seasons of his career with the Rockies. This could be his chance to finish his career where it started while helping Colorado return to the postseason. After signing with the Rockies last month, Holliday played 16 minor league games, mostly in triple-A. In those 16 games, he hit .345 with an OPS of 1.055. Those are impressive numbers for a 38-year old who hasn’t played a game since last fall. Despite going 0 for 3 in his season debut on Thursday, Holliday looks ready to help the Rockies down the stretch. Holliday figures to see some time playing left field against left-handed starters, which was the case on Thursday. The Rockies aren’t exactly desperate for outfield help these days. However, Holliday also gives the Rockies a professional hitter to use late in games in a pinch-hitting role. After reaching the playoffs as a wild card last year, the Rockies are once again in the thick of the playoff race. After Thursday’s win, they pulled within a game of the Diamondbacks for the top spot in the NL West. They are also tied with the Brewers for the second wild-card spot. However, there are currently four teams within a game of one another for those two spots. In such a heated race, every game coming down the stretch matters. If Holliday can help the Rockies winning an extra game or two late in the season, he could be the difference between Colorado making the playoffs or missing out.